Military aircraft batteries are either rechargeable or single use type batteries. Further, aircraft batteries are used as power source for the equipment installed on the aircrafts. Further, batteries used in aircrafts should have some essential properties such as light weight, reliable, requires minimal maintenance and it should be capable of operating efficiently in wide environmental envelop. Global military aircraft battery market is expected to grow at a compound annual growth rate (CAGR) of 4.2% during the forecast period i.e. 2017-2024. Further, a number of factors such as growing demand for advanced fighter aircrafts and increasing demand for light weight and reliable batteries for aircrafts in military sector are expected to fuel the growth of global military aircraft battery market during the forecast period. Global military aircraft battery market is segmented into battery chemistry and region. Further, battery chemistry segment is sub segmented into lead acid batteries, lithium based batteries, and nickel based batteries. Likely, lithium based batteries segment including lithium ion battery is anticipated to witness remarkable demand during the forecast period due to their high end performance at low temperature. Regionally, global military aircraft battery market is segmented into five major regions including North America, Europe, Asia Pacific, Latin America and Middle East & Africa region. Among these regions, North America accounted for 38.5% share of overall market of military aircraft battery in 2016. 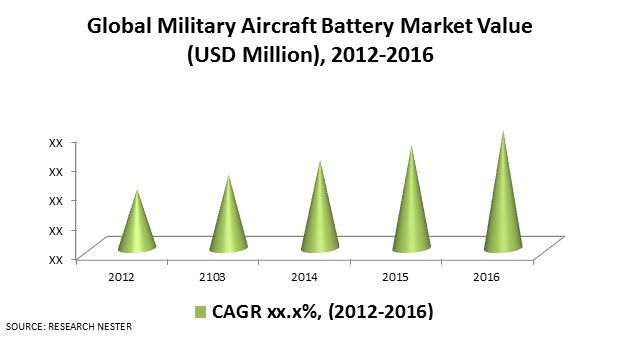 Factors such as high investment and technological advancements in military aviation sector are envisioned to bolster the growth of North America military aircraft battery market during the forecast period. Additionally, U.S. is likely to be the major contributor to the growth of North America military aircraft battery market during forecast period. Europe region is second leading market of military aircraft battery market and is expected to grow at a significant pace during the forecast period. Growing concern regarding border security coupled with rising political crisis in European economics including Greece and Ireland are forcing governments to strengthen their air forces. Likely, growing strength of air forces in European countries is expected to escalate the growth of military aircraft battery market in this region. Global military aircraft battery market is primarily driven by a number of factors such as ongoing territorial disputes between countries and rising technological advancements with military aircrafts all across the globe. Further, increasing terrorism activities coupled with growing concern towards national border security are forcing governments to invest in research & development of advanced aircrafts. Favorable government initiatives to increase the number of fighter aircrafts and to strengthen their air forces are likely to fuel the growth of global military aircraft battery market in near future. Furthermore, inclination of military aircraft manufactures towards lithium ion batteries due to their light weight and higher capacity is also fostering the growth of global military aircraft battery market. Moreover, growing demand for fuel efficient aircrafts is increasing the number of electric aircrafts in military sector. Apart from this, growing awareness towards advantages of electric aircrafts on the environment such as low carbon emission and less pollution is also a major factor which is fostering the growth of global military aircraft battery market. However, chances of fire accidents due to thermal runway of li-ion cells is a major factor which is likely to restarting the adoption of lithium ion batteries in near future. Further, this factor is expected to hamper the growth of global market of military aircraft market in near future.